Hello everyone! Welcome to part 1 of a 4 part developer blog series that we plan to share this week. 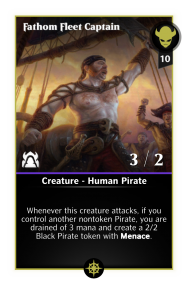 We are very excited to announce that Ixalan will be arriving next week. It is an exploration based world filled with cunning pirates, enraged dinosaurs, shamanistic merfolk and vampire conquistadors. It is MTG PQ’s first tribal set, and as such, we wanted to bring the tribal aspect to the forefront of the set; each tribe will have a defining mechanic and theme. Keep in mind that numbers (mana costs, power/toughness, etc…) of spoiler cards in this and other Ixalan blog posts might change prior to release. I’d like to start by giving you an overview of the mechanics present throughout all Tribes and the Set. Exploring Ixalan in search of the Immortal Sun and the Golden City of Orazca is a cornerstone of the set. As such, Explore is one of the set’s most exciting mechanics. In tabletop Magic, Explore allows creatures to “explore” the card on top of your deck and, if the card is a land, you would draw it. If not, the creature would gain a buff and you would be given the choice between discarding the card or keeping it on top of your deck. This last part of the ability is mostly referred to as card filtering. 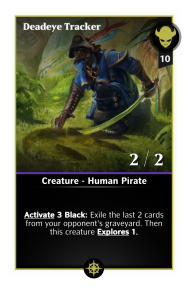 Here is a nice little spoiler of an Explore card that doubles as graveyard removal. Enjoy exploring Ixalan’s cards in your deck, as well as with your creatures! 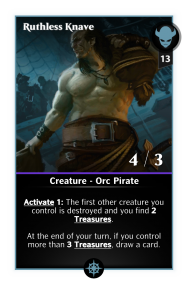 Ixalan also brings us the first iteration of Transforming Supports. 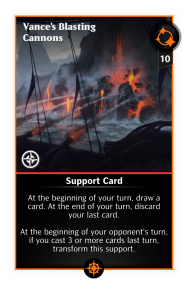 There are 2 cycles of double-faced supports in Ixalan: the rare Artifact cycle and the mythic (in tabletop Magic they are Rares) Enchantments cycle. Both of them transform into a support with the new Land subtype. The Artifact cycle are tools and vessels of exploration that eventually transform into Lands you discover. Since the Transform cards would be popular, we wanted to keep an entire cycle’s card rarity at Rare, to make sure players could experience the mechanic as soon as possible. The Enchantment cycle are events and rituals that happen in Ixalan that lead characters to new places. There is one per color and each is loosely related to the tribe they refer to. 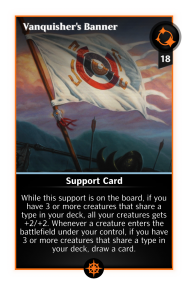 Check out the red support that refers to the Pirate tribe. We hope you have fun using these transform cards to create new and interesting decks around them! Go ahead and use Vanquisher’s Banner to lead your tribe to victory! The vampires of Ixalan are members of a religious society that have long sought a way to rid themselves of the need for blood. They came to Ixalan in search of the Immortal Sun to fulfill that goal. In their quest, they setup forts on the beaches of Ixalan, and brought their massive armies to shore. 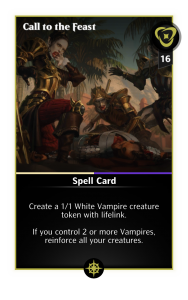 In tabletop Magic, Ixalan’s White and Black Vampires present a go-wide, token-making strategy. Naturally, go-wide strategies in MTG PQ are hard to create since we have a creature limit to respect. In light of that, we thought about how we could make a token-based Tribe function in MTG PQ, and naturally came to Reinforcements. In MTG PQ, the vampire tribe cares about reinforcements. 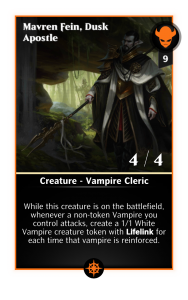 “Call to the Feast” is a spell that creates a Vampire token and, if you control 2 vampires, will reinforce all your creatures once. “Marven Fein” is a payoff for having reinforced vampires in play. Gather your vampires, and the Dusk Legion’s massive armies, to swarm and overpower your opponent! Ahoy therrrrre, matey! 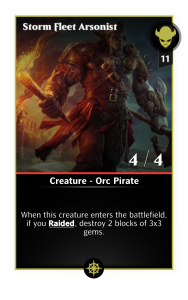 Pirates come to MTG PQ to Raid and plunder. Pirates are a tricky and evasive bunch that show up in Blue, Red and Black colors. They are all about attacking with evasion and gaining advantages every turn they do. In tabletop Magic, their signature mechanic, Raid, is turned on for a turn when you attack with a creature that turn. Once you do, all cards with Raid will turn their abilities on. 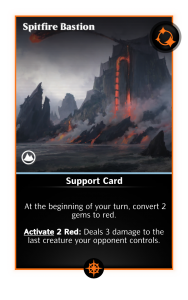 Since blocking works significantly differently in MTG PQ, this approach would not present the same interesting choices as it does in tabletop Magic. Therefore, we decided to make the ability into a trade off ability. In MTG PQ, Raid will be turned on if you attacked with a creature the turn before the current one. Every time you play a card that asks if you Raided, and the answer is yes, the card will trigger its Raid effect. After this, Raid will be turned off. In other words, only the first card with Raid you play each turn will trigger its Raid effect. Check out these pirates (with and without raid)! Also, Pirates love their Treasures… As such, a lot of them create Treasure in some way or another. Finding treasures will create 1 of 4 Treasure supports representing each Tribe. Making matches on gems with Treasures will generate mana for cards in your hand. 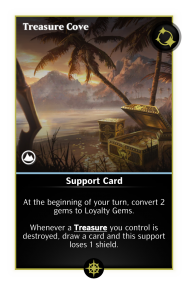 Be careful though, opponents might steal some of the mana when matching gems with your Treasures. 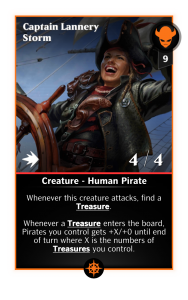 Draw cards, destroy gems and collect Treasures with Ixalan’s pirates! 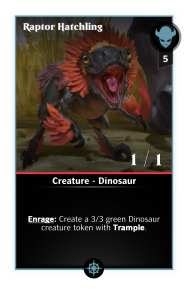 Dinosaurs are one of the most exciting tribes to bring to MTG PQ. It has been, alongside Pirates, one of the most awaited tribes in tabletop Magic, and long-time franchise fans will definitely enjoy them. 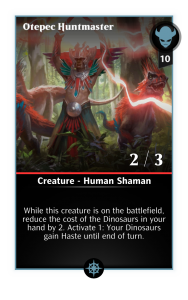 Two things define the White, Green and Red Dinosaurs of Ixalan: their symbiotic relationship with the humans of the Sun Empire, and they get really angry! I mean…Enraged! Their signature mechanic is the Enrage ability. 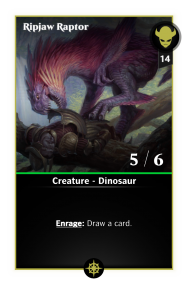 Dinosaurs with this keyword will trigger a special ability every time they take damage. Some dinosaurs will deal damage, others will draw you cards, and some even grow stronger after they take damage! We are excited to see how players will find interesting ways to trigger this mechanic both in and out of combat. 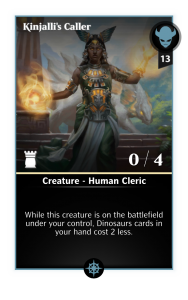 The humans of the Sun Empire are also represented, and often either empower their dinosaur companions or get stronger fighting alongside them. Cards like Kinjalli’s Caller and Otepec Huntmaster are the prime example of this relationship. Join the Humans & Dinosaurs of the Sun Empire in their search for Orazca! 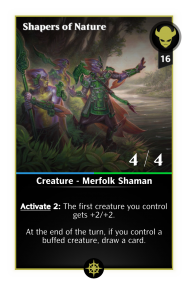 The last tribe we’ll look at is the Merfolk tribe. 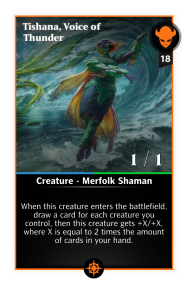 The Merfolk are a shamanistic people that call themselves the Shapers and protect Orazca, even without knowing its location themselves. They are all about enhancing and protecting their own. The Shapers, in tabletop Magic, care about +1/+1 counters. Here, they care about buffed creatures. These are creatures whose power and toughness get improved through any effect other than Reinforcing. 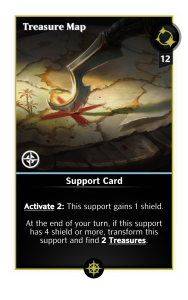 If a support you control is giving your first creature +2/+0, that creature is considered buffed. If a spell gives your creature +0/+3 until the end of turn, your creature is buffed until the end of turn. Cards like Herald of Secret Streams and Shapers of Nature are payoffs for having buffed creatures, and Tishana, Voice of Thunder is a strong card that enters the battlefield with a buff and refills your hand. Their sub-theme of protection is reflected on multiple cards that both have and give Hexproof to other creatures, as well as increasing costs of spells in your opponent’s hand. 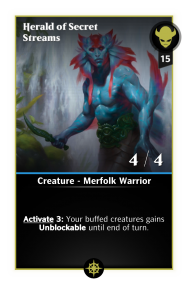 Buff your Merfolk and aid the Shapers in protecting Orazca! That is it for the Tribes and Mechanics of Ixalan! We hope you enjoy Ixalan and explore all the possibilities it brings! Read Part 2 of our developer blog series where we dive into the Planeswalkers coming to Ixalan. 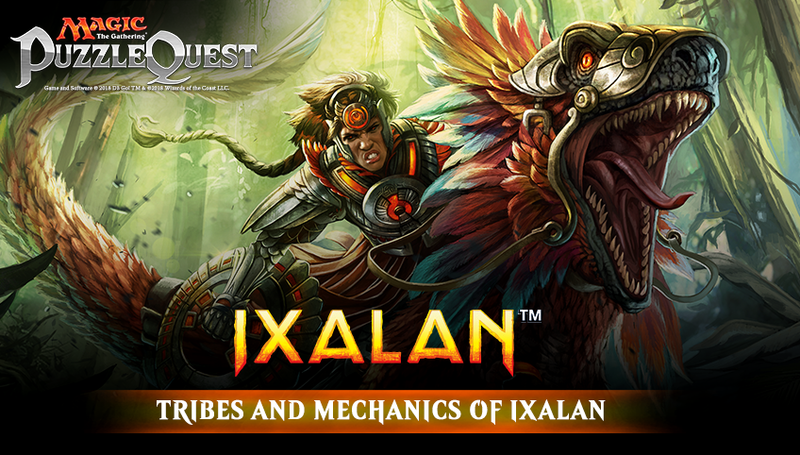 Ixalan is scheduled to arrive in Magic: Puzzle Quest next week (week of Feb 12).